Using the MiniSuit Bluetooth Keyboard has extended my phone in a number of useful ways. All of a sudden, entering in shell commands isn't a futile exercise. However, as I noted in my review of the MiniSuite, between its size and keyboard feel it's never going to be an effective for touch typing. 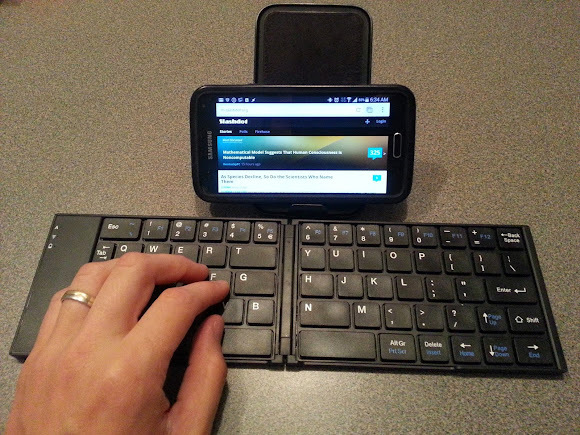 When I got a Galaxy S5, I wondered if it might be worth it to take a fresh look at Bluetooth keyboards. Perhaps I could find one that was touch typing friendly, and therefore even more useful than the MiniSuite. I looked around Amazon, read reviews and finally settled on the Perixx 805L Keyboard as my next attempt at keyboard greatness. There's no denying it, the Perixx is larger than the MiniSuite. 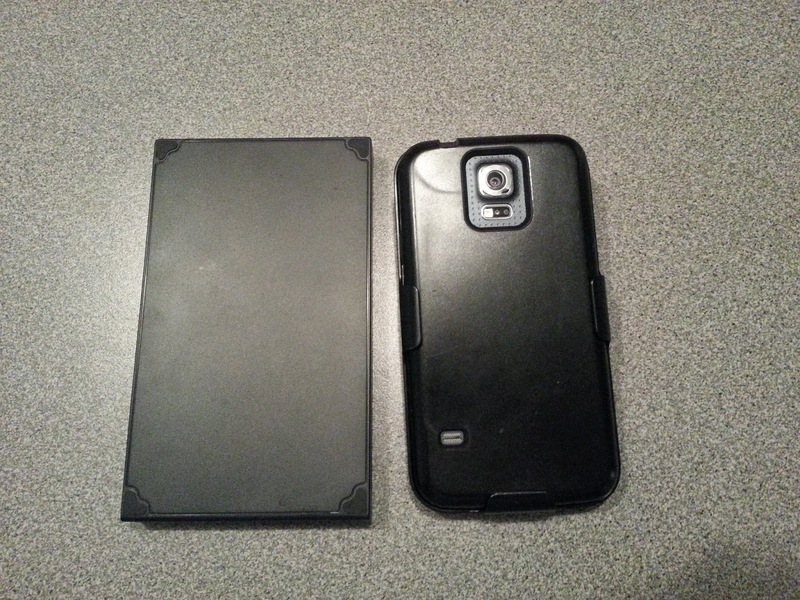 But, when I opened up the Perixx I was immediately impressed by the build quality. This thing is a real keyboard! The key feel is as good as any laptop I've used, if not better. And the keys are indeed full size. I quickly got an answer to my most pressing question: could I touch type on this thing? Heck yeah! In a world full of cheap knockoff phone accessories, it was nice to find Perixx. These guys are delivering real quality at a very reasonable price. That's not to say that the Perixx is perfect. There are a number of issues that both the community and I've noticed. Before I chimed in on them, however, I thought I should put the keyboard to real use. Over the last week or so, I've switched my morning e-mail correspondence time from my computer to sitting at the kitchen island with the a cup of tea and my S5 connected to the Perixx 805L. To add an additional data point, I brought the same setup (minus the tea) to a Religious Committee meeting last night and served as scribe. When I take minutes for a meeting they are usually done in transcript form, so I'm doing quite a bit of typing. Bottom line: my comments below are after thousands of keystrokes of experience, and not just my gut feeling. 1. It doesn't lock open. This means that you need to set the keyboard down on a solid surface like a table. I've founds this to be a non-issue. I need a flat surface to balance my phone + kickstand anyway, so requiring one for the keyboard isn't a stretch. 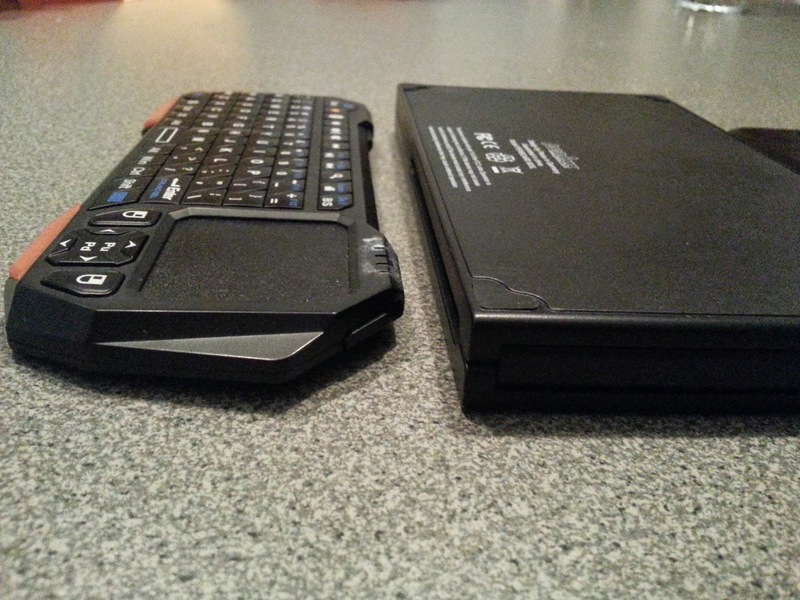 Once the keyboard is on a table, it remains quite solid. 2. It doesn't contain a touch pad. I liked the MiniSuite because I thought the built in touch pad would negate issues where I was switching between the keyboard and phone. This turned out, again, to be a non-issue. Thanks to my heavy keyboard mapping (see below), I was able to setup hotkeys to switch between apps. That meant that in many cases I wouldn't need to have my fingers leave the keyboard. In the cases when I did have to touch the screen, it was no more annoying than reaching for a mouse. 3. The keyboard layout is whacky, with some keys too large (e.g., the escape key), some keys too tiny (e.g., the backspace key) and some keys just laid out in the wrong locations (e.g., the shift key). At first I thought I could overcome this with shear willpower. But, that wasn't the case. I'd be typing away in Gmail and go to hit the 1 or ! key only to strike the ESC key. This results in the equivalent of hitting the back button, leaving the message in draft form and taking me away from the writing process altogether. And then there's the misplaced shift key. This one was also a major issue, as my attempts to hit 'Shift a' would end up with 'up arrow a', resulting in a brain halting mess. Enter External Keyboard Helper (EKH). This awesome little app allows you to trivially remap keys and setup hotkeys. I've now got my keyboard layout setup so that the 'up arrow' is shift, and the escape key is the equivalent of pressing the 1 key. To get invoke the escape key, I now press Fn F1. Alt e takes me to my e-mail, while Alt g takes me to Chrome. Control Shift l inserts a long winded URL to a Getting Started document I frequently share with my prospects. In short, EKH has saved the day. Sure, I occasionally get tripped up, but at last night's meeting I typed just as fast and furiously as if I had brought my Netbook. And during this morning's e-mail session I noticed no extra friction in responding to e-mails. 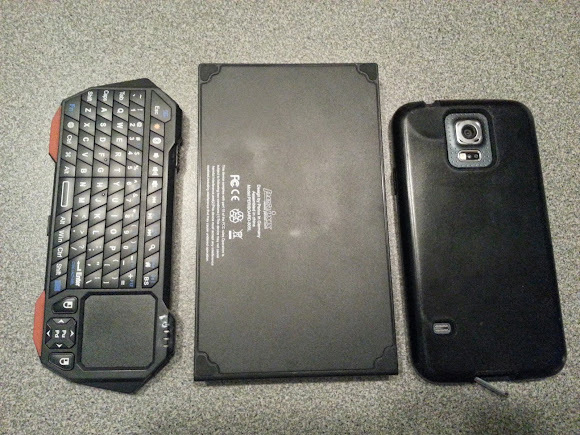 So it's official, the Perixx has replaced the MiniSuite as my Every Day Carry keyboard. Sure, it's larger, but a whole lot more powerful. Between the keyboard, the power of the S5, and the customizations I've made to it, I'm thinking I've now got a mobile setup that's just as useful as my Netbook is. For multi-day trips I'm almost certainly going to continue to schlep a laptop. But for short trips, or as a hacker's backup, this setup truly rocks. I'd played with the little BT keyboards for using Emacs on my Nexus 4 but eventually gave up and bought an OpenPandora instead. I'm very glad I did but if I had played with the keyboard you review here, I might have stuck with the phone approach. In the end, having a keyboard is key, no pun intended! :) I did try a work trip with a tablet and I struggled. I'd never heard of OpenPandora - from looking around though, it looks really sweet! Though, I think for now, the S5+Perixx should work well. Still, I'd love more Unix / Linux friendly options for my S5. Terminal IDE is amazing, and ssh'ing to a server and working from the command line is often quite doable. But still, I'd love to be able to run arbitrary unix commands on the S5. Oh well, a guy can dream. Is That Feather Safe To Touch?